Two of the world’s most loved companies once again go hand-in-hand to serve more smiles and everyday happiness to customers through the 2015 Coca-Cola Glass Collection. Now on the program’s 8th year, McDonald’s launches the 2015 Coca-Cola Glasses, available in all McDonald’s restaurants nationwide starting October 30. To collect the limited-edition glasses, customers simply have to add Php29 to any McDonald’s meal. “Through the years, McDonald’s and Coca-Cola remain to be the classic go-to choice of Filipinos. We are proud and happy that customers grew up loving and sharing McDonald’s burgers, French fries, and Coca-Cola with their family and friends,” said McDonald’s Philippines President and CEO Kenneth S. Yang. 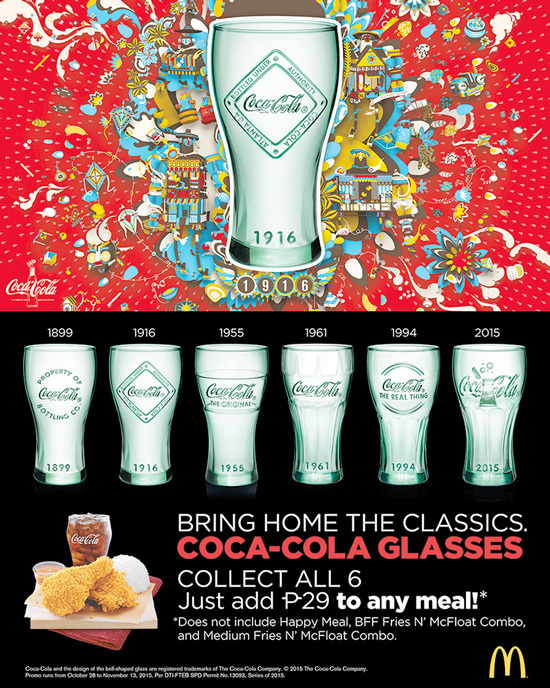 McDonald’s and Coca-Cola continue the tradition of spreading timeless happiness to customers with the Coca-Cola Signature Glass Collection, which inspired by the evolution of the iconic Coca-Cola contour bottle. There are six designs to collect, each is embossed with the Coca-Cola logo and is date-stamped, representing the imagery and advertising of the following periods—1899, 1916, 1955, 1961, 1994, and 2015. 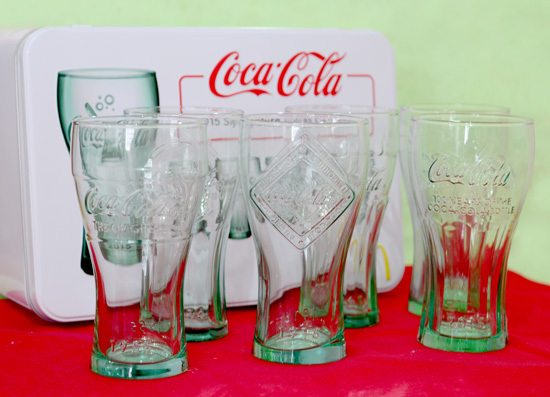 All glasses take the shape of the iconic contour bottle and are offered in the Coca-Cola bottle’s original Georgia green color. Collect all six designs only at McDonald’s via Dine-In, Drive-Thru, or McDelivery via 86-2-86, www.mcdelivery.com.ph, or the McDo PH app, all day, including breakfast hours. Share your collection at McDonald’s official Facebook page, www.facebook.com/mcdo.ph, or by tagging @McDo_PH on Twitter and Instagram. Thank you McDonalds for sending me these lovely, classic glasses. I already have collected three now sitting prettily in my china and I can't be happier thinking, I need just three more to make a dozen. These will be perfect filled with Coca Cola come Christmas. Awesome! Those are nice to have. I have a couple of thosea here at home. Rose, they are. 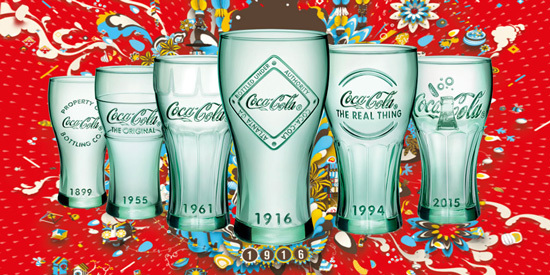 Each glass is stamped with different designs of the Soda's logo way back. McDo sent these, their lovely addition to my collection.. thanks for dropping by Rose.